With temperatures approaching minus 10 degrees in our part of the world we were glad that our entertainment at Bagni di Lucca’s theatre started in late afternoon rather than at 9 pm, the time many shows begin in Italy. 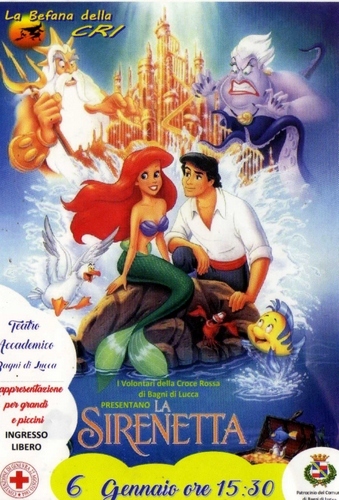 The local Red Cross association had put on a musical ‘La Sirenetta’, the little mermaid, based on Andersen’s adorable fairy story. It’s several years now that the Croce Rossa has put on a show. The association is almost wholly staffed by volunteers and it was a truly altruistic gesture to spend time in producing a spectacle which was fun to watch and also was able to collect contributions towards the various difficulties which the country is facing – for example, the earthquake victims in central Italy. All members of the cast performed their parts with vivaciousness and the theatre (which I’ve never seen so full before – we had some difficulty in finding a space even to stand!) responded with enthusiastic audience acclamation. Here are some views of that evening. The Befana, complete with her broom and wicker back-pack, made an appearance towards the end too! Well done Croce Rossa – we look forwards to next year’s ‘Befana presentation’ with anticipation! PS Don’t forget local residents: tonight there’s ‘Le Sorelle Materassi’ drawn from Palazzeschi’s famous novel at Bagni’s busy theatre! This entry was posted in Bagni di Lucca, Theatre by Francis. Bookmark the permalink. The Little Mermaid what a fantastic show full of colour joy and hilarity! A very entertaining piece for all ages old and young alike with several opportunities for audience participation in the English Panto style at Christmas time. A special mention and gratitude to the most amusing role of Roberto Lucchesi alias Coco who is always so versatile and generous in his creative roles I especially loved the lemon bowler hat and costume. Considering these were only amateur actors the event for Befana day was heralded as extremely successful considering the -2 or more degrees outside we enjoyed the warmth of the event and indoor temperature. Our thermostat is once more not working it is often colder indoors than outdoors especially when the sun is shining luckily Italy often has wall to wall sunshine unlike the UK. Thanks for your comment which was most welcome.